A lot of Philadelphians made their morning commute nursing a hangover on Monday. 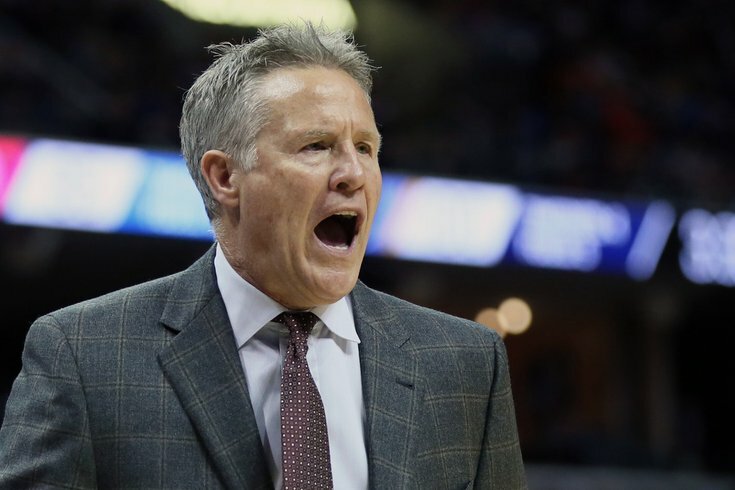 If you were expecting the Sixers to offer the cure for your NFC Championship headache, you went to bed on Monday evening sorely disappointed. There is no sugarcoating what the Sixers did down in Memphis. They gave away a game against an undermanned, undertalented Memphis Grizzlies squad that never should have had a chance, and a team trending in the right direction found a way to shoot themselves in the foot once again. Turnovers are the story from this one, as they've too often been all season. Philadelphia coughed the ball up 23 times in this one, including 10 times in the fourth quarter alone. This part of their team can be overblown at times — it's a natural byproduct of the young players they're built around — but some of the mental errors made in the final frame were simply inexcusable. That conversation starts with the players who have been responsible for most of Philadelphia's wins this season. Joel Embiid may have come up with a double-double anyway, but he had an erratic night and dealt with foul trouble for the middle chunk of the game. It clearly took him out of his rhythm, and it came as no surprise when he came off the bench to start the fourth quarter and looked lost. The Sixers have to live with Embiid's turnovers out of the post because he's able to quarterback their offense there and has inexperience to point to as a reason for some struggles. No amount of inexperience can explain throwing the ball away in the backcourt when there's no good reason to rush. Philadelphia plays with an exuberance that can make them breathtaking to watch for long stretches of time, but they have to find that balance between dictating the tempo and playing out of control. Ben Simmons is the biggest culprit for this problem, in part because he believes he can make every possible pass. You see that propensity for risktaking in all the game's best players — Steph Curry's behind-the-back turnover in Game 7 of the 2016 Finals is rather infamous — but Simmons is still figuring out when to force the issue. Really, that pass isn't out of Simmons' wheelhouse. He makes cross-court passes all the time and hits guys on the money, and his willingness to make those feeds gets the Sixers a lot more open shots than they would otherwise. That said, down two and with under a minute left, would it kill this team to slow down, take a breath and trust they can outexecute a 17-29 Grizzlies team? I would say I expect this level of dysfunction more than most, and it's a problem the Sixers should grow out of eventually. Youthful indiscretion and late-game execution issues fade over time. Knowing that makes it no less frustrating to watch, particularly when you can point directly to the team's best players at the heart of the issue. Brett Brown did not pull any punches in his postgame assessment, telling reporters his stars did not play like stars throughout the game. To his credit, Simmons was approached with this information and accepted the evaluation without punching back. "We weren't," said Simmons. "We sucked. We didn't make big plays down the stretch, we didn't take care of the ball, defensively we weren't too bad, but yeah, he's right." This comes back to something I asked Brown about following a win over the Raptors on Martin Luther King Day. He acknowledged how the team's mind frame changes as blown leads begin to snowball and believes their solutions aren't as simple as barking orders at guys. "All we really had to do was dribble it out, and instead we're playing volleyball," said Brown of their game on January 15. "That attitude, that feeling, 'here it comes again,' there's probably a little bit of that in there. And it's stuff that we've got to get older and keep pushing forward. It's not a mystery to me of why this stuff happens, and it's not as simple as you know why you're sick, here's the medicine and you've fixed it. It's growing a bunch of young guys." Their lack of composure is fairly obvious in these situations, and I agree with Brown that I don't think it's as simple as waving a magic wand and expecting it to heal in an instant. The road to success is rocky and disjointed, and the Sixers will keep toying with your emotions the rest of this year, possibly beyond. If they can start slowing down the game, it should go a long way. In any case, they can't keep giving away games against bad teams, because it erases the work they've done against the better ones. Officiating complaints normally get pushed toward the bottom of the story, but the ref crew was ridiculously bad in Monday night's game. Both sides ended up on the wrong end of a lot of whistles, and it made a rough game to watch even more excruciating. I'm a proponent for letting guys get away with a little extra contact, but it's fine to call games tight as long as you're consistent about it. The guys in Memphis did no such thing, missing some obvious foul calls while whistling guys for some real softies. It ruins the product, and it makes it really difficult for players to get anything going when they can't get a feel for what they can and can't get away with. It's no excuse for the poor outing, but this has an especially large impact on a player like Embiid, who lives on generating contact and really sinking his teeth into a game. Bounced in and out of the game with foul trouble, he never really had a chance to do so. That said, he didn't exactly take advantage of his opportunities when they came, either. Embiid missed three huge free throws in the final minutes of the game, and you don't have to be a mathematician to understand their significance in a 105-101 loss. If you don't cash in when the opportunities come your way, it's hard to have much sympathy for the lack of whistle love. If you're looking for a silver lining on a brutal night for the local team, look no further than their second-year wing. TLC came out scorching from downtown, and he finished 6/8 from three in the best shooting performance he has had in the NBA. Don't look now, but the Frenchman is up to 34.7 percent shooting from three-point land on the year, pulling himself up to around average shooter territory. It's a three-percent jump from last season on only 40 fewer attempts, and giving the Sixers another average shooter off the bench would be massive moving forward, especially because he has the length and athleticism to play some defense. What's to credit for his upswing? It could be a small sample thing, but it could also be the product of simply getting more playing time. Luwawu-Cabarrot has found himself yanked in and out of the rotation depending on the game, and his play has mostly warranted that. But perhaps simply knowing he had room to fail allowed him to play free against Memphis because he was hitting all sorts of shots from outside. Dario Saric took a huge step up after he was inserted into the starting lineup early in the season, and perhaps the mental boost of being in the first five was enough to get TLC going as well. His stint there isn't likely to last as long as Saric's assuming JJ Redick isn't out for too long, but for now, it's good to see signs of life from last year's first-round pick.